Spring has sprung and it’s the perfect time to plant and tend to your indoor/ outdoor garden. What’s this? You don’t HAVE a garden? You don’t even own any plants? You think your green thumb is black?! Not to worry. With the right tools anyone can be a plant parent. That’s right… ANYONE! This is coming from someone who used to think that she couldn’t keep a plant alive to save her life. When I moved into my first apartment that had some backyard space, my Mom insisted that I have a small garden there. I kept telling her that I wasn’t sure I could do it, but she was patient with me. She helped me pick the right plants, the right pots to put them in, and she taught me when to water them and how to make sure they were getting the right amount of light. Pretty soon I was hooked and saw these plants as my little pets. I find it very relaxing to be out there tending to my garden, and the reward is fantastic when your plants start to grow and bloom! Cacti are very easy to kill!! – I can’t tell you how many people have told me “I’m not good with plants Megan. I’ve even killed a cactus before!” Well you know what, so have I! There is this perception that cacti are super easy to take care of, but they are actually very picky plants. They require a lot of light and they need to be watered so infrequently it ridiculous. If you over-water them even just a little bit, they can die. As a beginning gardener, you want a plant that can be over-watered or under-watered and still do OK. Sometimes plants just die – this is a basic rule of gardening. Some of your plants are going to die, and it’s not always your fault. Maybe they didn’t get enough light, or maybe the weather was too extreme for them, or maybe it was just their time to go. I can’t tell you how many plants I’ve had that just didn’t make it for one reason or another. It’s sad, but it happens to all of us. All you can do is find another plant and try again. Container gardening is the way to go – Putting your plants into pots (instead of into the ground) is a great way to get your green thumb going. Different plants need different kind of access to the sun (shade loving vs. sun loving plants) and each area of your yard/home gets a different amount of sun. 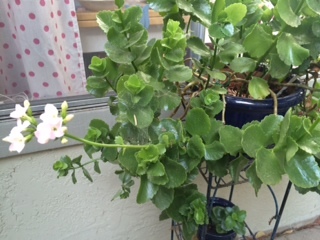 If your plant is in a pot, and you can see it starting to show signs of being unhappy (wilting for not getting enough sun or leaves burning because they are getting too much sun) all you have to do is move the pot! Problem solved. Step 1 – assessing the light. Think of where you would like to put a new plant, (especially indoors vs. outdoors) and take note of what kind of light that area received through out the day. This is going to be very important information when you are choosing what kind of plant you will get. Step 2 – choosing the right plant. Try and get a plant that’s no too picky. I like spider plants (because they do well inside and outside and are good in lower light areas), baby roses (they are very hearty and if they get a lot of light they will be happy), and various succulents (these guys are in the cactus family, but they like more water and generally do very well with a good amount of light). The best place to go to get a plant is your local nursery. Tell the clerks where you are planning to put your plant, what kind of light that area gets, and make sure to tell them you want a plant that is hearty and easy to take care of. 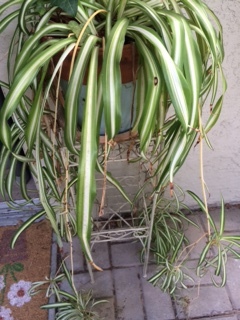 This is one of my spider plants. The best part? All of those little tendrils can be cut off and planted to become a whole new spider plant!! Step 3 – buying the right pot. This is probably the single greatest tip I can give you for success as a plant owner…buy a pot with a hole in the bottom. It doesn’t really matter what the pot is made of, just make sure there is a nice big hole in the bottom of it. This is essential because if you give your plant too much water (which happens all the time) the extra water will just drain out the bottom. If there’s no hole at the bottom and you overwater the plant, it can get root rot and die. That hole is going to keep your plant healthy and happy, and keep you from having to worry about giving your plant too much water. Step 4 – always buy extra soil. When you are planting new plants, buy two times the soil you think you will need. It’s amazing how quickly those large bags can get used up. It’s also good to have either some coffee filters or pieces of newspaper around to put at the bottom of the pot. That way when you pour dirt into the pot and when you water your plant for the first time, a whole bunch of dirt won’t come out of the bottom. Step 5 – Squish the roots. When you remove your plant from the plastic pot it came in, it’s usually root bound (meaning the roots have run out of space and it needs more room). Before you plant it into it’s new pot, be sure to really squish the roots up. This tells the roots that they are entering a new, bigger home and they should start making themselves comfortable. Step 6 – Don’t forget the drain dish. Since your new pot has a hole in the bottom, it’s a good idea to get a drain dish to catch all the excess water that may come out when you water your plant. Congratulations! You are now a proud plant parent. And it wasn’t even that hard, was it? Happy planting and have a wonderful Spring! While most of America was at home this past Sunday watching one football team beat up on the other, I was hanging out with my Mom, doing the farthest thing from football we could think of. We were shopping at an outlet mall. Yep, the big game is a great time to go places that would normally be very crowded on a Sunday. And let me tell you, there was hardly anyone out there shopping with us. It was great! We got a lot done in a very short amount of time, and we got some great deals to boot! 1. Make a Game plan – Most of us don’t make “quick trips” to an outlet mall. It’s something that we usually plan (mostly because outlet malls are usually located far away from home). So before you go, do your research. Most malls have websites that have lists of stores and maps of store locations. This past Sunday, I printed out a list of all the stores and highlighted the ones my Mom and I wanted to visit. Then I highlighted the locations of said stores on the map. This was exceedingly helpful, because it made navigating easy and we didn’t have to drive around hunting for our favorite stores. That’s not to say all stores do this, but it’s good to know what you may be buying. Take a close look at the item you are going to purchase. Does it feel like a good quality item, or does it feel “cheap” somehow? Do you see a lot of loose threads on the item? Does the item fit well when you try it on? When in doubt, look at the tag. Generally speaking, tags that came from the original store have a cut or a sharpie mark through them (to indicate they were sold at a discount) while items that were made for the outlet malls do not. This of course is a may not be true in all cases, but it may help you make a decision on whether or not to purchase the item. Even if an item is made specifically for an outlet store, that doesn’t always mean it’s not worth buying, but I believe it is important to have all the facts in before you make your decision. I wish you the best of luck with your outlet mall excursion. Have a blast, and happy shopping! Quick Tip – Spin your way to an easier laundry day! Ahh Sunday. A day of rest, relaxation, and for some of us, a day to do our laundry. If you’re like me and you live in an apartment, you probably have to utilize a shared laundry room or maybe even use a laundry mat. That’s great for doing full loads, but what if you only have a few items that need washing? I’ve found the perfect solution to save you time (and those precious quarters) and it’s something you probably already have in your home… a salad spinner! First, take the top off the salad spinner and take the basket out. 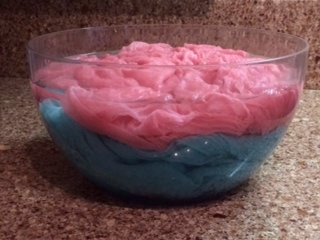 Put a small amount of laundry detergent into the basin, and start to fill with cold water. It’s important to use a very small amount of laundry detergent when hand washing so you can wash the detergent out more easily. Place your items into the basin and make sure they are fully submerged in the water. Let your items soak for at least 15 minutes. Once they are done soaking, pour the water out. Fill the basin again and rinse all the items. Pour as much of the water out as you can, lift the items out of the basin, put the basket back into spinner, and put the top back on. Place the salad spinner on a large, flat service and start spinning. You may have to stop multiple times to empty out the water that is being spun out of your clothes. Once you have reached the desired level of dryness, pull your clothes out and hang them up to dry! Since they shouldn’t be dripping wet anymore, you can hang them almost anywhere (although I prefer hanging my clothes on the shower curtain rod in my bathroom). 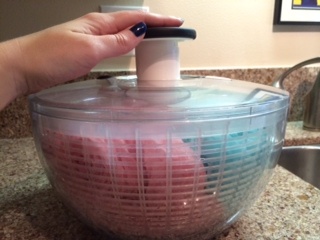 As you can see, I use the OXO Good Grips Salad Spinner (I like it because you push the handle instead of turning it). You can use any salad spinner you prefer, but be sure to use one that has a big enough basin to fit your clothes into. If this is something you intend to utilize on a regular basis, you may want to buy a salad spinner expressly for laundry purposes. *Get out of a sticky situation – my coworker came to me one day last summer (on one of the few really warm days in San Francisco) and asked for my help with her footwear. It seems her adorable silver wedges were sticking to her foot every time she walked. I gave her my little bottle of baby powder and told her to shake some onto her foot. She did and presto… No more sticking! You can do this any time you wear open toed shoes because not only does it prevent stickiness, it’s also great at keeping your feet cool and dry. *Keep your shoes smelling fresh – If you’re like me then you probably keep one (or four) pairs of extra work shoes at your desk. Keep those shoes smelling great by shaking a little bit of baby powder in there after you’re done wearing them for the day. Your coworkers will thank you. *Get the squeak outa here – If you’ve got hard wood (or laminate) floors, and you’ve got some boards that squeak a bit, put a little baby powder in between the slats and let it work it’s way down. *Love your hair – If you’ve got the second day hair blues, shake in a little baby powder into your scalp and brush it out. It basically acts like a dry shampoo and removes some of the oil while giving your hair a little more life and bounce. *Grease be gone – Since we know that baby powder is good at absorbing oil, it’s great for getting grease stains out of clothes. Just sprinkle baby powder onto the stain, let it sit for at least 10 minutes and brush it off with your finger. You may have to repeat this step several times before the stain is fully removed. If the stain isn’t fresh, you might want to put a little water on it first. *Fresh and Clean – Finally, one of my favorite tips. When you’ve changed your sheets, sprinkle a little bit of powder in them at the top of the bed near the pillow. It’s something my Mom always used to do and it’s such a nice treat for yourself to have good smelling sheets when you climb into bed. I’m also told that if you sprinkle it all over the sheets during the really warm summer months it can help keep you cool. With all of these tricks you can use any kind of baby powder you prefer. 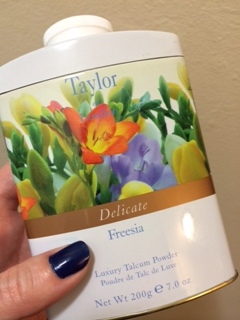 If you don’t like the smell of regular baby powder, or if you just want to splurge a bit, you can find really nice smelling body powders at discount stores like TJ Maxx, Homegoods and Marshalls in the bath and body section. I found the one pictured below for $6 at TJ Maxx, and it smells fantastic! 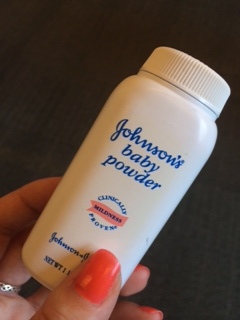 Do you have a use for baby powder that’s not on this list? Please feel free to share it in the comment section below. Happy fixing! Hi there! Welcome to my very first blog post! I’m very excited to be here and to give this whole blogging thing a go. I’m new here, but I have a feeling the more I hang out, the more I will get to know how all this works. Firstly, let me introduce myself. My name is Megan and I am a resident of Northern California. I’ve lived in the Bay Area most of my life and I love it here! I work at a non-profit focused on the environment, and in my free time I’m actively involved in the Theatre scene. I’ve recently discovered a love of traveling the world (I’ve been to Ireland, Scotland and Australia in the last few years) and I’m excited to see where my next trip takes me. So your probably asking yourself “That’s all fantastic Megan, but why is this blog called MacGIRLver?” I’m so glad you asked! I wear a lot of very different hats in my daily life, and I have one motto that’s universal to all of them… Be prepared for anything!! I’m that girl that always has a band-aid, safety pins, a thumb drive, a collapsible shopping bag and pepper spray in my purse. When I’m performing in a show, I always bring extra clothes and other small items (like duct tape) that can fix costumes in a pinch. One drawer in my desk at work is filled almost exclusively with small items that can solve a variety of problems. With what’s in that drawer I can fix a ripped seam, take the squeak out of a shoe, do my eye makeup and get stains out of my clothes in a flash. It’s because I always come prepared that my good friend Theresa nicknamed me “MacGIRLver,” and it’s a nickname I have really come to love! The truth is I like to help people and share all of the cool things I have discovered over the years. And not just for fixing things… I’m also the queen of getting a good deal! All of these things made me think that maybe I could share all of these ideas in a blog! With some encouragement from my family and from Theresa, I’m here and I’m giving it a go! I hope I can give you some cool ideas for how to make your life easier, and maybe even save you some money in the process. *Do you have a coffee cup or mug with coffee/tea stains? Fill the mug with hot water, put a teaspoon of OxiClean in and let it soak overnight. The next day, clean the mug with soap and water and your stains will be gone! This also works well with those hard to clean reusable water bottles. *Do you have a bathmat that you use inside your shower? Those things can be hard to clean well. Fill the tub with hot water and approximately 1/2 cup of OxiClean and let the bathmat soak for several hours (or even overnight). Let the water drain and then take a scrub brush and give the mat a quick scrub. Rinse well and your bathmat will look good as new! *Finally, I use an OxiClean soak to clean pots, pans, sponge holders, sink mats, drying racks and even removable oven racks (seriously, I did this when I moved in and my oven racks looked brand new)! The one thing I will say is that OxiClean does leave a slightly slippery film on anything that you soak in it. A good rinsing with soap and water should get rid of it. Also, make sure the item you’re soaking is safe to soak in OxiClean. If you aren’t sure, do a test on a small area before soaking the whole thing. So that’s all I have for now. Happy fixing!